Youth substance use is a leading public health concern in the United States. The U.S. spends over $700 billion a year in alcohol, tobacco, and drug-related problems associated with health, crime, and lost productivity in the workplace.i Because most substance use concerns manifest in adolescence and the young adult years, evidence-based prevention and early intervention strategies for youth are particularly vital to reducing the burden of substance use on individuals, families, and communities. In recent years, policies and services implemented as a result of the Affordable Care Act have significantly impacted primary care and behavioral health delivery systems by emphasizing the value of preventive services, promoting models for primary care and behavioral health integration, engaging communities in population health strategies, and increasing access to substance use and mental health services. 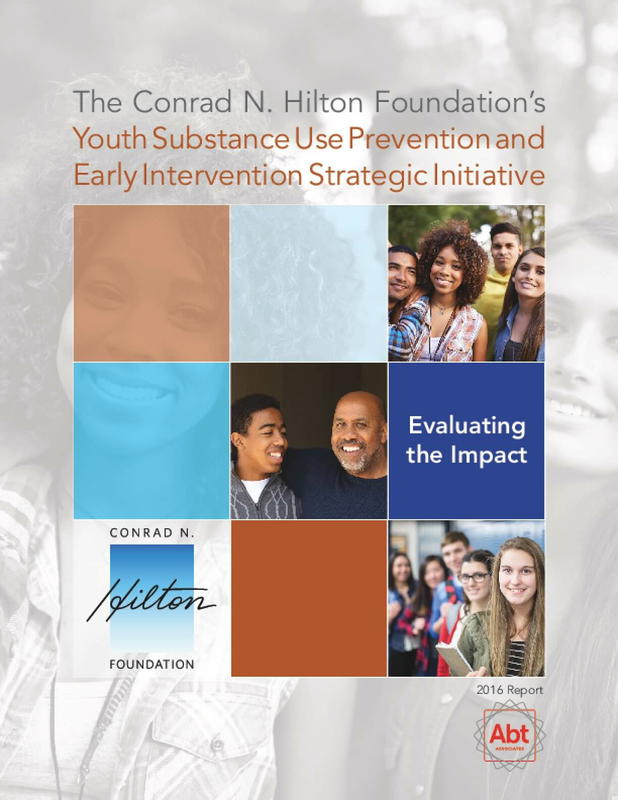 Capitalizing on this momentum, the Conrad N. Hilton Foundation's (the Foundation's) Youth Substance Use Prevention and Early Intervention Strategic Initiative (Strategic Initiative) is leading a movement in how people think about, talk about, and address youth substance use. This initiative is laying the groundwork for long-term change through communications and advocacy, preparing the workforce, promoting evidence-based practices, and aligning services across physical health care, behavioral health systems, and community supports nationwide. The Strategic Initiative is designed to advance the understanding of substance use as a health issue by implementing screening and early intervention approaches to prevent and reduce substance use among youth as part of routine practice in health care and other settings where youth receive services. The Strategic Initiative's work is centered around a public health, population-based approach of screening, brief intervention, and referral to treatment (SBIRT). Screening refers to the routine, universal administration of validated questions to identify potential risk related to alcohol and drug use, followed by positive reinforcement for youth who screen as 'no' or 'low' risk. Brief intervention is one or more short, motivational conversations, typically incorporating feedback, advice, and goal setting around decreasing 'moderate' risk related to substance use. Referral to treatment describes the process of connecting individuals with problematic use ('high' risk) to appropriate assessment, treatment, and/or additional services based on their level of need. The intent of the SBIRT process is to identify and address substance use and related risks– including health, social, and legal consequences attributed to substance use– through developmentally appropriate interventions or referrals to other services when indicated. Historically, youth substance use has been solely addressed through prevention interventions focused on abstinence or substance use disorder services provided through traditional specialty treatment systems. The SBIRT framework addresses the gap between primary prevention and treatment for disorders by identifying use and potential risk early and intervening before the use of alcohol or drugs leads to more serious consequences. Copyright 2016 by Abt Associates. All rights reserved. Copyright holder(s) Conrad N. Hilton Foundation , ABT Associates, Inc.